I have always preferred cookbooks produced by food writers and cooks, which usually contain a wealth of trusted much-loved recipes for home-style cooking and it is for this very reason that I love Donal Skehan’s new cookbook, Kitchen Hero. 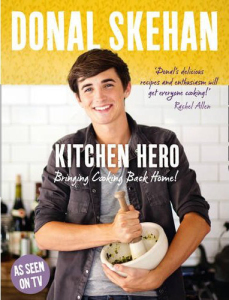 Donal is a self-taught cook who began sharing his amazing recipes and food photography on his blog, Good Mood Food (which can now be found at www.donalskehan.com) and his passion and ability to inspire cooks of all levels led to his first cookbook, Good Mood Food, and much deserved success. Good food to me is all about simple fuss-free cooking at home for sharing with family and friends and Kitchen Hero is exactly the type of cookbook that will enable you to do just that regardless of how much experience you have in the kitchen. It is full of fabulously simple and fresh recipes whether you are looking for simple supper ideas or fabulous party food, ideal not only for newcomers to the kitchen but also for anyone looking for some new fresh ideas. A big thing for me when it comes to cookbooks is the list of ingredients accompanying each recipe – living in a fairly remote part of Ireland it can be difficult to source anything approaching exotic so I love when a cookbook features ingredients that can be bought in most supermarkets. As soon as I flicked through Kitchen Hero I instantly compiled a list of at least ten things that I wanted to try and first on the list was the Asian Pork Lettuce Cups. I love Asian flavours and I am a huge fan of the Chinese restaurant classic, meat or yuk sung, and this is a fresher, lighter version of that without the fried noodles. It was a huge hit in this house and the entire plate was devoured within minutes. My sister tried the Sticky Barbecue Spare Ribs and said the sauce was so nice she had to stop herself eating most of the sauce from the pot whilst it was cooking. Kitchen Hero has a fantastic array of recipes – Meals in Minutes, Party Food & Drinks, Salads & Sides, Comfort Food, Stretch Your Meals and Easy Desserts & Baking – there is bound to be something for everyone in there. I am really delighted that there is a TV series to accompany the book – Kitchen Hero kicks off tomorrow night (Monday 16th May) on RTE1 at 8.30pm and I for one can’t wait to watch! Hello Vanessa! Oh that’s a shame – can you watch on RTE iplayer or are you restricted? I know we can’t watch BBC progs from here. The Asian Pork Lettuce Cups deserve some kind of medal for the sheer simplicity and taste, went down a storm the night of the online dinner party and the mix produced enough for a tasty cold lunch the next day. Looking forward to seeing what the TV show produces. Hi Ken :) I totally agree! I made double the quantity and was very glad I did – very simple and quick. Really looking forward to the show – I think it will be very fresh and a welcome change. I am just about to embark on the banoffi pie!!!! I have never attempted one……fingers crossed. We watch a lot of “food programmes” in our house and we are really enjoying Donal and his cooking.